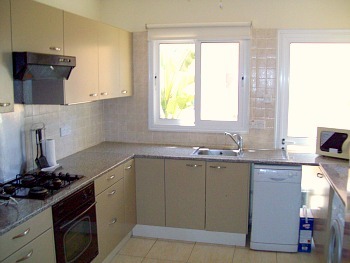 Our Cyprus property for sale has 3 bedrooms, 2 shower rooms and a large bathroom. Designed and built by a good local family run Cyprus property developer. 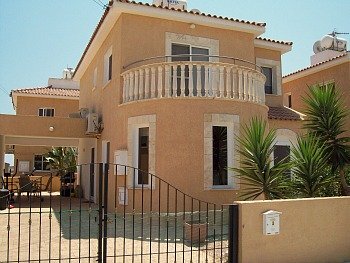 Located in a quiet residential area of Xylofagou Village which is in the Larnaca District. Only 30 minutes to Larnaca International Airport and 10 minutes to the very popular Ayia Napa resort. The resale home is on a small development of 6 villas set around a large communal pool with views over the country side. We share the cost of maintaining the pool which makes it much cheaper than having your own private pool. Shared cost is 30 Euros a month per household, at least half the cost of a private pool - which is approximately 60-70 euros a month. The larger the pool the more it costs. Double gate entrance to long driveway and car port, side door to property with fly screen door. There is also a single gate to the front porch which is also fitted with a fly screen door. Gravelled front garden with mature flowering bushes and yuka trees. The large lounge has an attractive semi circle bay, 3 slim windows with fitted cream roller blinds. Satelite TV and telephone point. Air condition unit and modern, silent running ceiling fan with single light. Cool cream ceramic floor tiles are fitted throughout the ground and upper floor. The downstairs bedroom has 2 double floor to ceiling custom built wardrobes, window with fly screen and black out blind. Quiet running a/c unit. 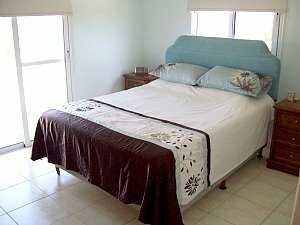 We have used this room mainly as a separate dining room but is easy to turn into a bedroom or an office. The downstairs shower room is fully tiled and has a full size shower cubical, toilet, wash basin with mirror over. The separate kitchen is fitted with Ikea units. There are plenty of upper and lower cupboards including 2 floor to ceiling storage cupboards, 1 fitted with handy sliding shelves. Electric fan assist oven and gas hob with stainless steel splash back. part tiled walls. Ceiling fan, window to rear with flyscreen. We will be leaving some of the electrical appliances, ie; cooker, washing machine and fridge freezer. The marble staircase leads to the upper floor and landing. We fitted a solid wood door at the top of the stairs, which acts as a fire door and cuts noise between the ground floor and bedrooms. 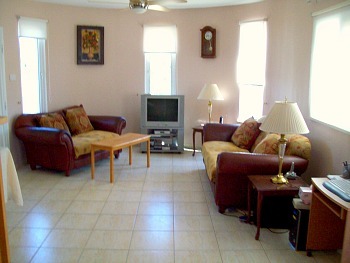 The landing leads to the master, 2nd bedroom and large bathroom. The large master bedroom has an ensuite shower room, 2 double floor to ceiling custom built wardrobes, tv and telephone points, a/c unit and remote controlled silent running ceiling fan. Patio doors lead to a half moon balcony with Greek style marble ballastrad surround. Large double bedroom with double floor to ceiling wardrobes, a/c unit, window with flyscreen to rear with views over the large communal pool and countryside. Large bathroom, decorated with Mediterranean blue and white tiles, vanity unit with large under storage, tall white storage cupboards. Fitted with white bathroom suite, overhead shower with enclosure, window to rear fitted with fly screen. Car Port, BBQ, dining table and 6 chairs. Garden shed. Large pool with spacious sunbathing area. Stairs down to toilets and showers. 90 euros every 3 months, including water and electricity cost for running the pool. The pool is well cared for by a professional pool cleaner who maintains and cleans the pool and surrounding area twice a week. We have personally recommended him to many new residents in the area. The council tax for our Cyprus property for sale is 370 Euros this year which includes twice weekly refuge collection. Like more information or view our property? If you would like more information about this Cyprus Property for Sale or would like to view, Just get in touch. We are more than happy to answer your questions or set a mutual time to view.